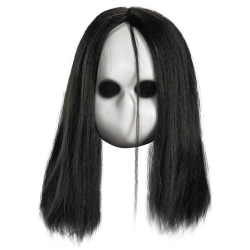 Plastic blank white doll face mask with black eyes. Mask is made from a rigid plastic and has black one way see-thru fabric covering the eyes so that you can see out but others cannot see in. This mask is sure to creep just about anyone out. Wig pictured is not included.